In the previous part of this short series, we have learned about simple use case – acting as an OAUTH client. Now, it’s time to bring our experience to a whole new level. We are going to build much more complex environment, where InterSystems IRIS is going to play all OAUTH roles. We know already how to make a client, so let’s concentrate on authorization server and even more, the OpenID Connect provider. As in the previous part, we need to prepare environment. This time it is going to be trickier, as there are more moving parts. Before we go into the details of our example, we need to spend a few words about OpenID Connect. As you may recall from previous part, we were asked – in order to be authorized by Google – to authenticate ourselves with Google first. The authentication is not part of OAUTH framework. In fact, there are many authentication frameworks around, independent of OAUTH. One of them is called OpenID. Started originally as an independent initiative, it recently leverages infrastructure provided by OAUTH framework, namely communication and data structures. Thus, OpenID Connect was born. In fact, many people call it OAUTH on steroids. Indeed, with OpenID Connect, you can not only authorize, but also authenticate using well known interfaces of OAUTH framework. We will leverage much of the client code from the part 1. This saves us a lot of work, so we can concentrate on setting up environment. This time we need to add, to already existing web server with SSL enabled, a PKI infrastructure. We need some cryptography required by OpenID Connect. If you want authenticate someone, you want to be absolutely sure that no-one else can impersonate the agent (client, auth server,...) who sends his/her confidential data over the network. This is where X.509 based cryptography comes in. Please note: beginning with Cache 2017.1, it is no more needed to use X.509 Certificates to generate JWT / JWKS (JSON Web Key Set). We, for the backward compatibility and simplicity, use this option. Strictly said, we do not need to use Caché PKI infrastructure at all, but it is more convenient way than using tools like openssl directly to generate all certificates. We are not going into details of generating certificates here, as you can find details either within InterSystems IRIS documentation or elsewhere. As a result of generating certificates, we will create 3 public/private key pairs and associated certificates. Without going into details about how to define X.509 Credentials, we just show a screenshot of AUTHSERVER instance credentials. Here the CLIENT owns private key and certificate, but only certificate with public key of AUTHSERVER. We do not need to define X509 credentials at RESSERVER instance in our example setup. Similarly to configuration described in part 1 of this series, we need to configure our servers for OAUTH. 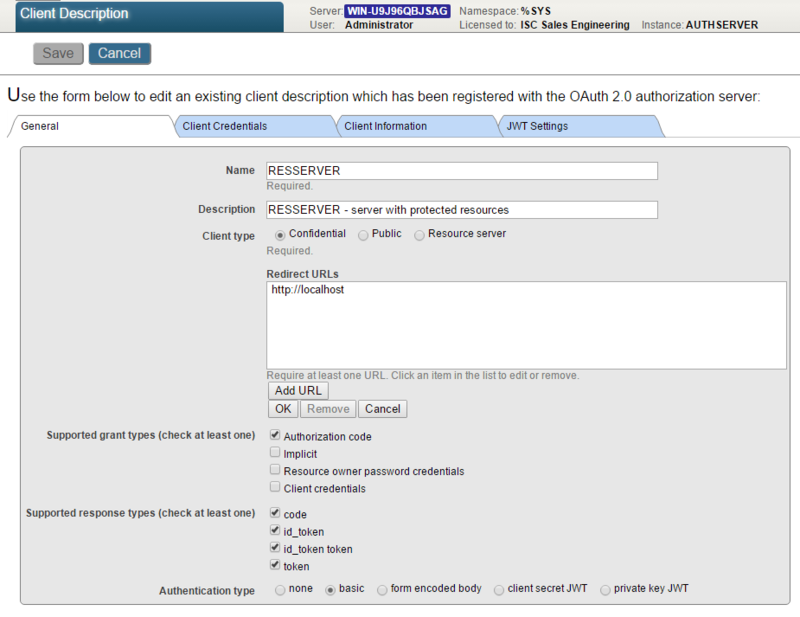 Let’s start with AUTHSERVER instance, as this is the central component in overall OAUTH configuration. In System Management Portal, navigate to System Administration > Security > OAuth 2.0 > Server Configuration. · check supported grant types, for our demo just check all four types. However only Authorization code is used. · optionally check Support user session - this means that an httpOnly cookie is used by the authorization server to keep the current user of this browser logged in. The second and subsequent requests for the access token will not prompt for user name and password. · accept default or enter custom values of customization options – please note – change Generate token class valued from %OAuth2.Server.Generate to %OAuth2.Server.JWT so that a JWT is used as the access token rather than just an opaque token. Having defined server configuration, we need to supply server client configuration. Within the page with server configuration form, click Client Configurations button and then press Create New Configuration for your CLIENT and RESSERVER instances. This image shows CLIENT configuration. Leave JWT Token tab empty - with default values. As you can see, we populated fields with meaningless data, unlike in real application case. As you can see, there is only very basic information needed for resource server, namely you need to set client type to Resource server. With CLIENT, you need to provide more information, the Client type (confidential as our client runs as web application capable of keeping client secret at server, not sending it to client agent). In SMP, navigate to System Administration > Security > OAuth 2.0 > Client Configurations. 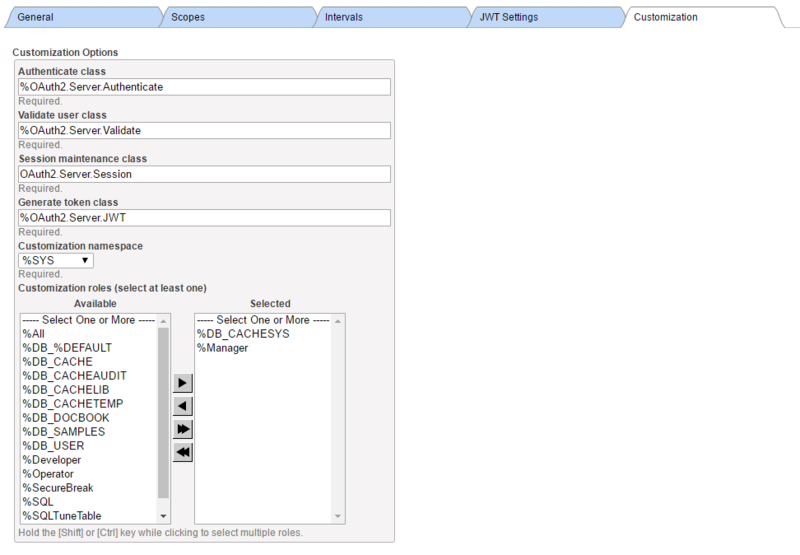 Click Create Server Configuration button, fill the form and save it. Make sure that Issuer Endpoint corresponds to the value we defined earlier at the AUTHSERVER instance! You also need to modify authorization server endpoints according to your web server configuration. In our case we just embedded ‘authserver’ into each input field. Now, click Client Configurations link next to the newly created Issuer Endpoint and click Create Client Configuration button. Good! At this moment we have both CLIENT and AUTHSERVER configured. That could be enough for many use cases, as resource server may be just a namespace of AUTHSERVER, thus protected already. But let’s consider that we want to cover a use case where an external doctor is trying to retrieve data from our internal clinical system. So in order to allow such doctor to retrieve data, we definitely want to store his account information INSIDE our resource server for auditing and forensic reasons. In that case, we need to continue and define configurations at RESSERVER. As you can see, this configuration is using the same data as corresponding configuration at CLIENT instance. Creating WT from X.509 Credentials is not recommended, but we used it for compatibility. Oh yes! Indeed, this was tedious, but necessary process. But now we can move forward, and start coding! To keep things as simple as possible, we will recycle much of code from our Google example we described in part 1. The client application is just two CSP pages, running in /csp/myclient application, with no security enforced – it just runs as unauthenticated user. 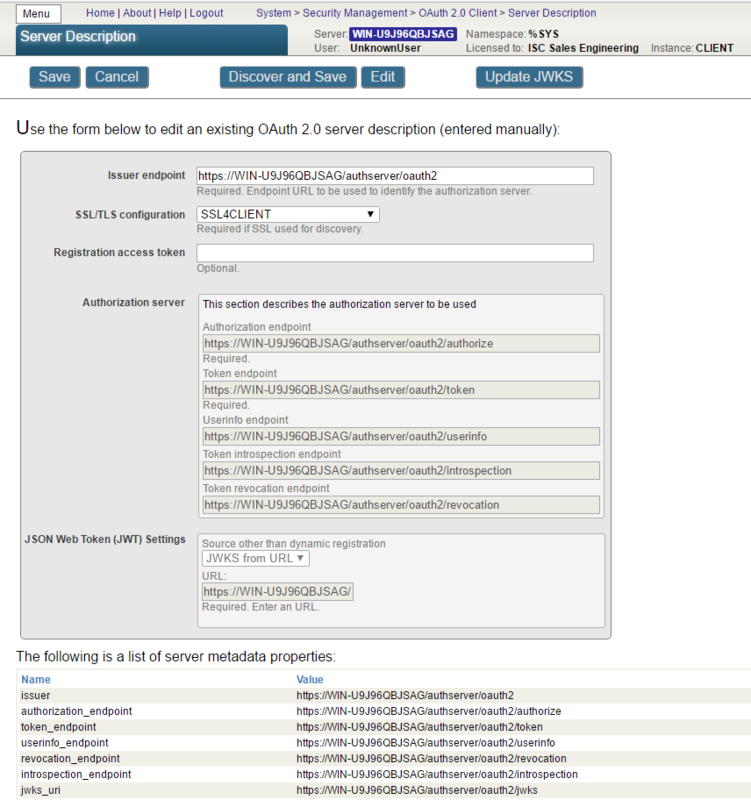 <p>This page demo shows how to call Cache&acute; API functions using OAuth2 authorization. // Get the url for authorization endpoint with appropriate redirect and scopes. // The returned url is used in the button below. // DK: use 'dankut' account to authenticate! // Validate and get the details from the access token, if it is a JWT. // Call the introspection endpoint and display result -- see RFC 7662. // Validate and display the IDToken -- see OpenID Connect Core specification. // Call the userinfo endpoint and display the result -- see OpenID Connect Core specification. write "<h4>Call resource server (delegated auth)","</h4>",! 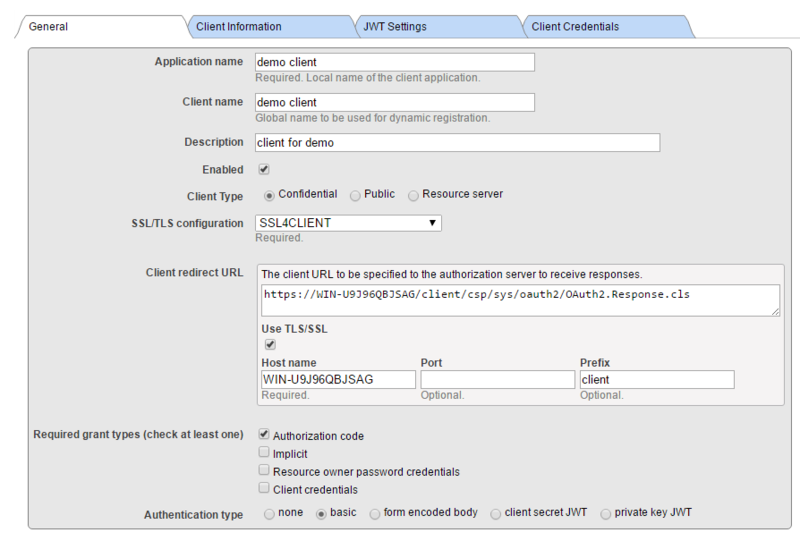 write "<h4>Call resource server - no auth, just token validity check","</h4>",! As you could see, reading through the code, indeed, there is almost no difference to client code we showed in part 1. There is something new that comes with page 2. This is some debugging information, and checking validity of JWT. 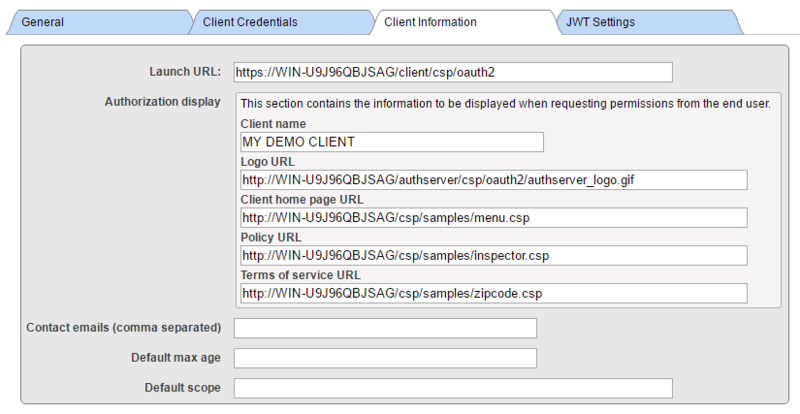 Once we validated returned JWT, we could introspect data coming from AUTHSERVER about the user identity. We simply presented this information to the page output, but we can do more with it. As in the above mentioned use case of an external doctor, we can use the identity information and pass it to the resource server for the authentication purposes if required. Or just passing this information as parameter to API call to resource server. Next paragraphs will describe how we used the user identity information, in more details. The resource server can be the same server as authorization / authentication server and in many cases that would be the case. But in our demo, we made the two servers separate InterSystems IRIS instances. So, we have two possible cases, how to work with security context on the resource server. This is the simple case. 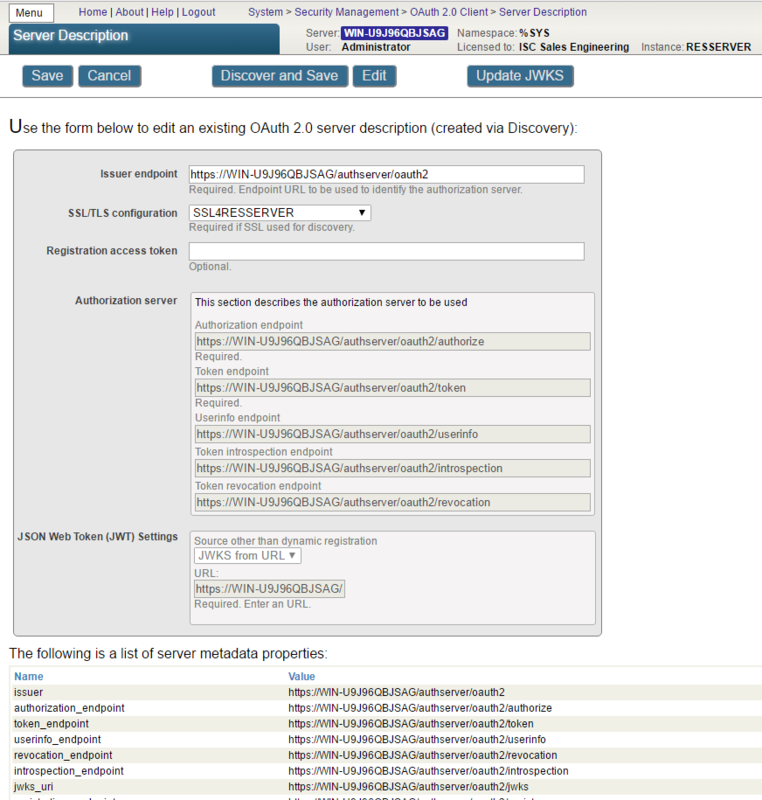 Authorization/ authentication server are just the same Caché instance. In this case we can simply pass access token to a csp application, which is specifically created for a single purpose – serve data to client applications that use OAUTH to authorize them to ask for data. 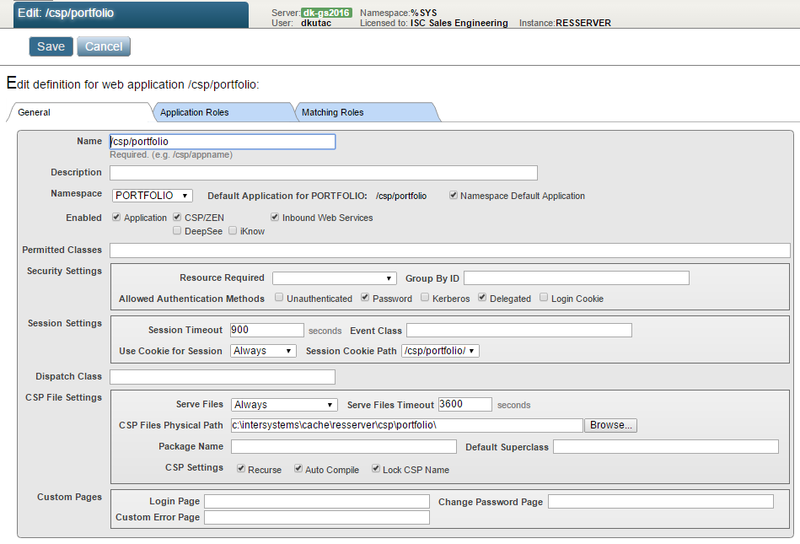 The configuration of the resource csp application (we called it /csp/portfolio2) can look like the screenshot below. We put just minimum security into the application definition – allowing only specific CSP page to be executed. Alternatively, the resource server can provide a REST API instead of classic web pages. In real life scenarios, this is all up to the user to fine-tune security context. w "<p><h3>Hello from Cach&eacute; server: <i>/csp/portfolio2</i> application!</h3>"
w "<p>running code as <b>$username = "_$username_"</b> with following <b>$roles = "_$roles_"</b> at node <b>"_$p($zu(86),"*",2)_"</b>." This is another extreme case, we want to utilize user’s identity at resource server to the maximum possible extent – as if the user was working with equal security context as internal users of resource server. One of possible potions we have, is using delegated authentication. To get this setup running, we need to perform a few more steps to configure the resource server. The ZAUTHENTICATE routine implementation is very simple and straightforward, as we trust the AUTHSERVER who provided user identity as well as his/her scope (security profile), so we simply accept whatever username is coming and pass it along with scope to resource server user database (with necessary translation between OAUTH scope and InterSystems IRIS roles). That’s it. The rest is done seamlessly by InterSystems IRIS. // todo: watch out for potential collision between standard account and delegated (openid) one! // access token authentication is performed by means of Delegated authentication! // uses the introspection endpoint to ensure that the access token is valid. w "<p><h3>Hello from Cach&eacute; server: <i>/csp/portfolio</i> application!</h3>"
If you were really paranoid, you could set Permitted classes as we did in first variant. Or, again, use REST API. But all this is way beyond the scope of our topic. Next time, we are going to explain individual classes, introduced by the InterSystems IRIS OAUTH framework. We will describe their APIs, and when / where to call them. Whenever we mention OAUTH we mean OAuth 2.0 as specified in RFC 6749 - https://tools.ietf.org/html/rfc6749. We use shortcut OAUTH just for simplicity. Very interesting article series. 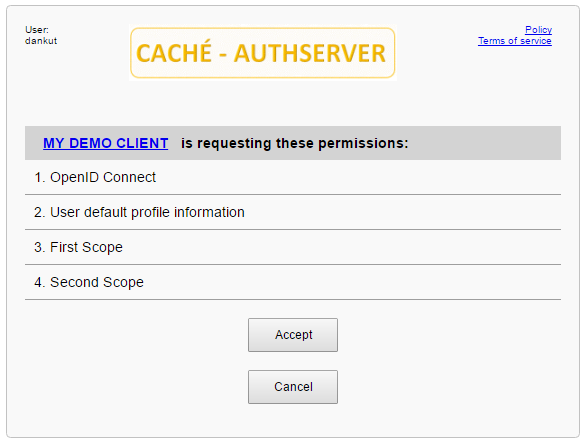 I've just started to look into the OAuth 2.0 options supported by Caché. We are considering it as a method to secure an Angular (2+) application for communition with a Caché REST backend. Do you know if anyone else testing/using a similar approach? I noticed that there are a few missing images in the AUTHSERVER section. Would it be possible for you to add these to the article again? Lasse, can you be more specific please? I'll be happy to add more information, but I need to know what are you missing. I was referring to images in the AUTHSERVER section that should show a sample configuration for the authentication server. The following images fail to load for me: 4_4.png, 5_3.png, 6_2.png, 7_0.png. Oh, now I see. I'm using Microsoft Edge as default browser and it displays them OK. Chrome is the troublemaker. I'll see what can I do to fix it. All images are displaying correctly for me now (in Chrome as you correctly guessed). Thanks! 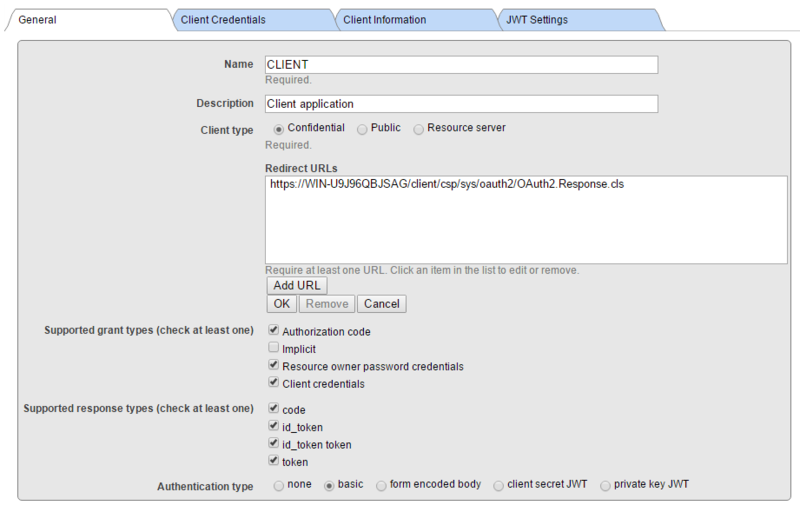 Hello Daniel, I'm trying to figure how to make a REST resource available through JWT access token. For your resource oauth2test.demoResource, but it doesn't seem like this method validates the access token itself. As it only checks for http header validity. Any help regarding this doubt is appreciated. I am trying to implement OAuth auth server, a client and a resource REST service. I am using password grant type. I want to set up delegated authentication for the OAuth client. I have been able to get most of the setup working and am having trouble with the last part. As per instructions, I am using %session.Login in my oauth client, but when I try to go to the resource url, the session is changing and so I cannot access the resource page. 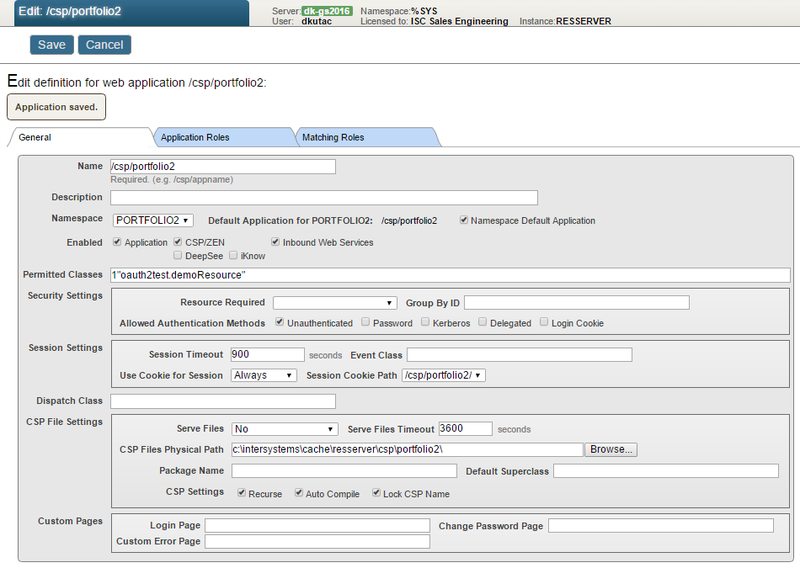 I have tried setting groupid for the client and resource web applications, used CSPSHARE and CSPCHD. Wondering if the trouble might be that the client application is unauthenticated, but resource application is delegated auth. Is there any way to use delegated auth for password grant type. Any help you can provide is greatly appreciated. Just wanted to post an update on this. I was able to resolve this issue. After a call to GetIntrospection, we need to check for the value of jsonObject.active. If the token is invalid, GetIntrospection might return ok status, but active will be false in jsonObject. sorry for delay in answering, I'm on vacation with limited access to computer. Glad you have resolved the issue!